How we decorate our homes is a reflection of who we are as individuals, and every room in a house displays a theme or creates a particular atmosphere. 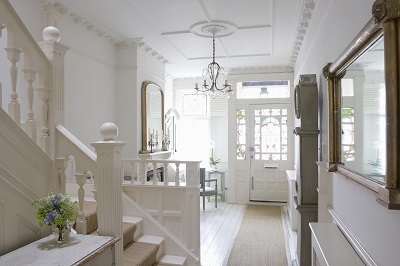 Hallways are more neutral areas that contribute to the flow and display items that do not fit in any specific room. Hallways and landings are great places for seasonal decorations as they are public spaces that everyone in the household and guests can see. Often, hallways provide a glimpse into the family photo album. For instance, parents display progressive photos of their children through the years at important milestones. This is also a place to hang photos in remembrance of family members and friends who have died. This blog offers tips on how to best hang photos and other art in a hallway in order to create a fluid transition between rooms. In households with small children, at night hallways represent the unknown. It can be intimidating for kids to leave their bedrooms for the dark hallway in order to use the bathroom or grab a glass of water. Hallway night lights or glow in the dark stars can be incorporated into the decor to help children feel more comfortable. Regardless of your particular circumstances, this site has useful tips for stylish and functional hallway decor.